Sixty white fiberglass oxen have arrived and are being distributed throughout the valley to artists who will paint them, draw on them, collage and even armor them, transforming them through the summer into works of art. Then, in January 2015, they will be auctioned to businesses and private citizens at the “Oxtion Gala” to be held at Grounds For Sculpture. A sneak preview of what you will eventually be seeing throughout the Hopewell Valley is on display now in the Investors Bank Art & Healing Gallery at Capital Health – Hopewell. Putting that vision into practice, Capital Health became a founding sponsor of the “Stampede!” movement. 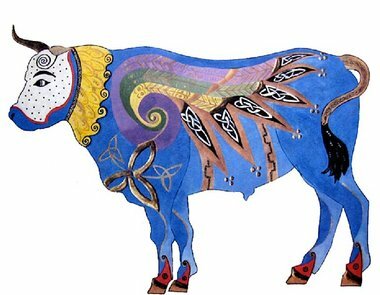 Four oxen will be on permanent display at the Hopewell campus when they are fully dressed with their new artistic personalities. Beginning today, visitors can browse through 60 of the artists’ designs, which are mounted for display on black foam boards and are accompanied by the artists’ statements describing the materials used and their motivation for choosing that design. “George’s Senior Officers,” also looks toward the history of the region, as it depicts George Washington’s crossing of the Delaware River. It will be painted by “Artist Choice,” a group of senior citizens of Hopewell Valley who paint together one day a week. For this, the ox will wear a flag on his rump, stars on his hoofs and the crossing scene painted on his coat. Some lighthearted oxen will also frolic through the valley. “Ox Tops — Champion of Recycling” by Barbara Delafield will be wearing plastic bottle tops and container tops and lids, as well as painted circles, curves and flowers, all in bright primary colors. Jane Zamost’s “Splendor in the Glass” ox will be wearing glass mirrors, some metal cans and china in a color palette Zamost describes as green for growth and renewal; brown for strength, stability and support; and gold for elegance, sophistication and triumph. Tatiana L. Sougkova’s design on display indicates hers will be a more minimalist design reflecting on the simplicity of Bauhaus, the colors of Mondrian and the use of common symbols, as in the art of Takashi Murakami that reference sunflowers. In his statement on display, Joel Cermele says he researched words and phrases about oxen and settled on a serene field of daisies — the Oxeye Daisy — “calm and gentle like the nature of the ox,” whom he calls a gentle giant who is passive, obedient, steady and bright. But Gyuri Hollósy and Mary M. Michaels see the ox in a different light. They plan to dress their “Arttoro” in simulated armor in overlapping layers to give him a matador essence. Chad Coerner’s design and statement outline his plan for his “Lucky Lindy, The Spirit of Hopewell” ox. Because Charles Lindberg Jr. moved to Hopewell shortly after his nonstop transatlantic flight in 1929, Coerner’s ox will wear metal-look paint emulating the body of the airplane Lucky Lindy flew. The writing style of the Spirit of St. Louis will be replicated and altered to read “Spirit of Hopewell.” There will be aviator emblems and tags and the N-X-211 aircraft I.D. tag on the body. The ox will wear a leather aviator cap and goggles and stationary wheels on his hooves. Allow yourself a lot of time when you visit this exhibit. You’ll be captivated, as was I, not only by the designs themselves but also by the statements of these 60 incredibly imaginative artists. The Hopewell Valley Arts Council began as a grass roots effort by locals who recognized the need to provide opportunities for all ages to participate in the arts. “Those who like to do and those who just enjoy,” says Elizabeth “Betsy” Ackerman, who co-chairs the group with Randee Tengi. “Our ultimate goal is to raise funds beyond the ‘Stampede’ to have a physical space for our local artists. Ackerman continues. Anyone wishing to volunteer can go to the council’s website, hvartscouncil.org and sign up. Another opportunity will be to visit the council on Pennington Day, May 17, when it will occupy and animate the Howe Common. Come September, maps will become available to lead everyone on a scavenger hunt to sites where the oxen will be on display. Other events are in the planning stage and will be announced as those plans solidify. And the “Oxiton Gala” Auction will be held in January 2015 at Grounds For Sculpture.